Yesterday, I happened to read a real life Binjai ghost story on one of my favorite blogs Hari’s got Tales . It was about the author’s encounters with Caucasian apparitions in a small town called Binjai. It was very interesting but it spooked me no end. Of course it was posted keeping in mind the Halloween season. And as if that hair raising tale was not enough, one of my cousins sent me a must see link to this very interesting game Web Genie. I was hesitant to open the link for fear of encountering a real genie. Nevertheless I did, and was real glad I did. Web Genie is actually a web genius.We just have to think of a real or fictional character and it will guess the name. It is very very interesting and it worked every time. In no time, my whole family got addicted. If you haven’t tried it so far, do give it a try. I am sure they have a superb software behind it but it is simply amazing. 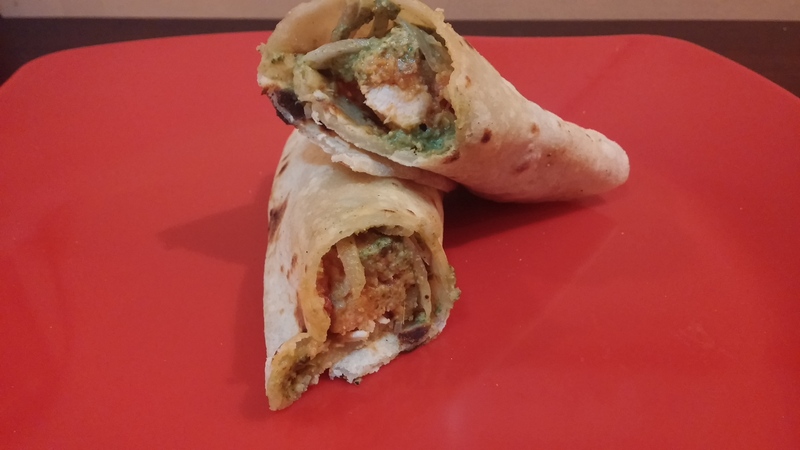 It is a deliciously different roll, mainly because the wrap is made with Potatoes and Flour and stuffed with juicy chicken tenders and a mint chutney. Make a smooth dough and divide it into lemon sized balls. 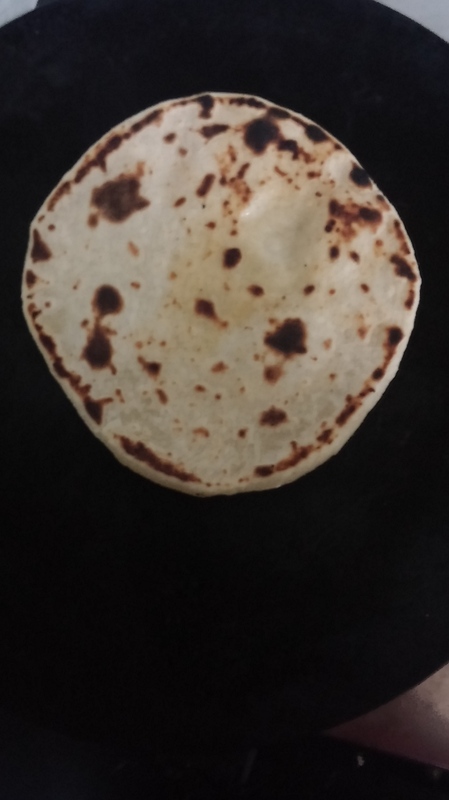 Roll each one out into round tortillas. 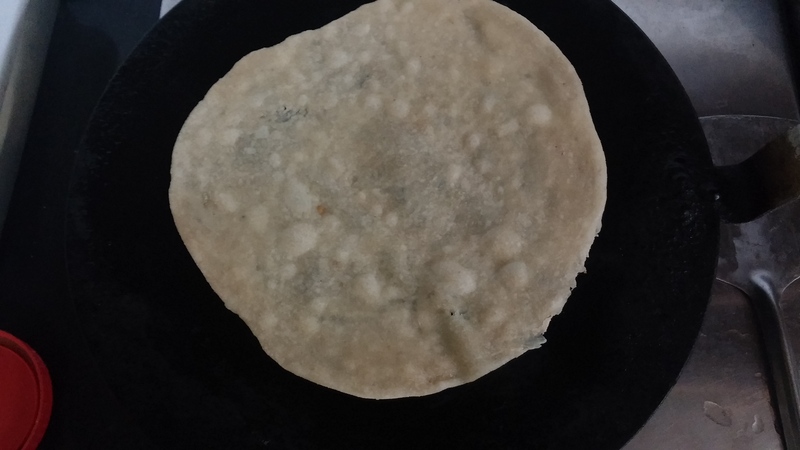 Heat a flat iron pan and cook the tortillas on both sides until light brown spots appear. Keep these aside. Heat oil in a skillet and saute the onion paste, ginger garlic paste and chopped tomato. Add chicken and cook till done. Add the seasonings and remove from heat.Set aside. 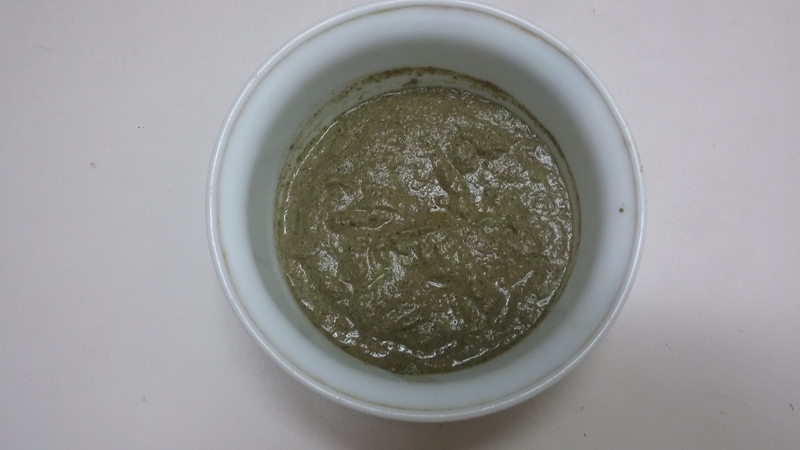 Blend together to a fine paste. 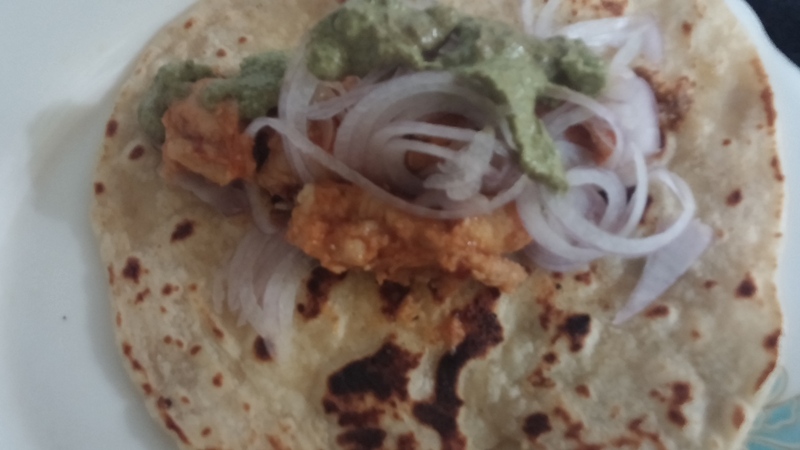 Take one tortilla and put some chicken filling, mint chutney and sliced/ grated onions. 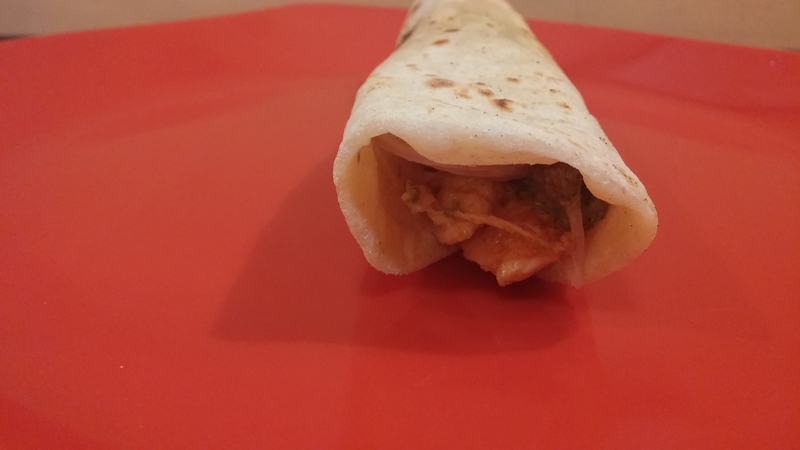 Fold into a tight wrap and serve warm. Come along and have fun at the most happening party at The Novice Gardener’s…..
Those rolls look delicious. Perfect party food. This looks wayyyyyyyyy too tasty…………. like, I might have to make this tonight so that I can stop thinking about it!!! It’s not even 10am and I’m ready for lunch now, ha! Thanks for sharing! The Web Genie sounds so much fun. Your wraps would make a great go too on a hurried day too. It really is 🙂 a lot of fun. Do try it when you are free. 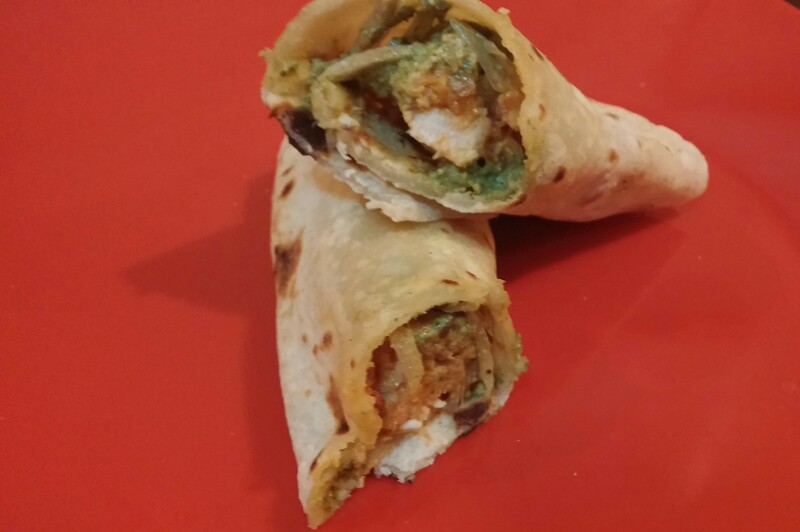 And yeah the wraps can be made in advance and kept in a hot box or warmed in the microwave when needed. These look very tasty indeed!! 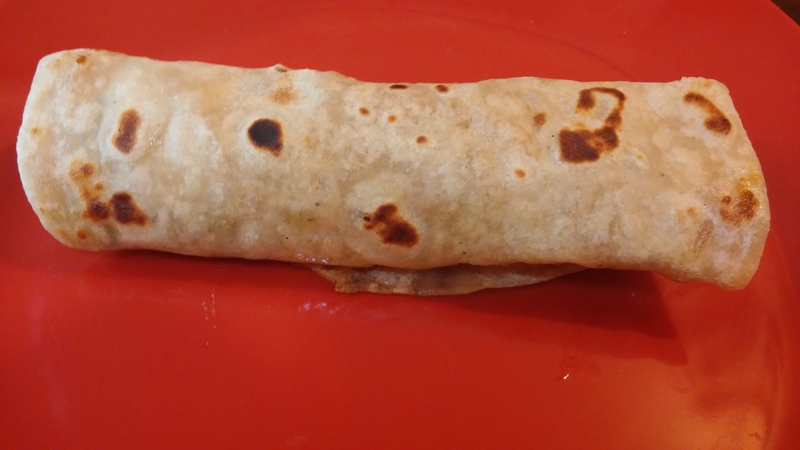 Thank you 🙂 The addition of potato to the flour makes the wrap softer and tastier . Do try it. you will love it. Perfect party food, perfect of hearing scary stories! Thanks for being at FF! 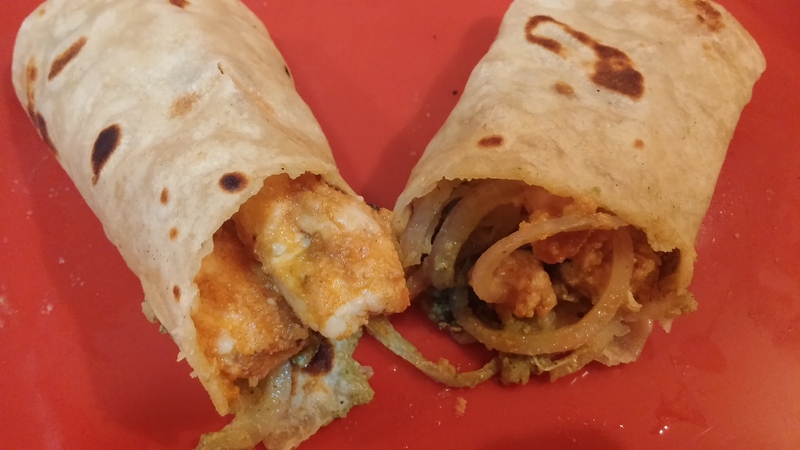 Chicken Frankie/kathi rolls are my favorite. thanks for posting them! Thanks a lot 🙂 I am unable to access your website. could you send me a link? You have to Andy 🙂 Let’s make a deal. My whole tray of frankies for that one delicious slice of your Mocha Cake. Done? A wrap made out of potatoes, sign me up 🙂 They look awesome! Have a wonderful weekend. Thank you Sarah 🙂 Have a nice week ahead. Yea! Super easy. Do try it. You could make the bread tastier by spraying some oil or butter while cooking on the pan. You must. I am sure you will like it!! !